Founded in December 1983, Medica recognized a market need for small, low cost, easy-to-use Electrolyte analyzers in the low test volume clinical diagnostic laboratory market. We started development of a Sodium Potassium analyzer with a simple two button “Yes / No” user interface that would allow an operator, with little laboratory experience or training, to run a clinically accurate analysis from a whole blood, serum or plasma sample. Reagents and sensors were configured as plug-in modules for easy replacement by the operator – no tools required. Our first manufactured units were sold into physicians’ office testing sites in the United States. We quickly recognized that our product was also ideal for testing needs in Europe, Asia, and developing country applications outside the United States. As our international business grew, we translated the user interface and labeling into all languages requested by our customers, while the physical design of the analyzer, components, and functionality remained as originally manufactured. 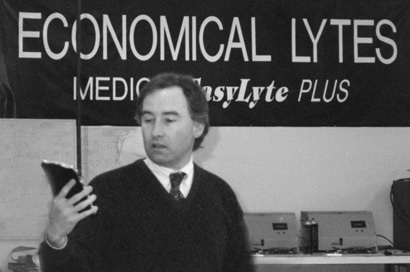 We named our first product EasyLyte and went on to add additional electrolyte parameters, taking advantage of the modular design, engineering and manufacturing techniques that we developed for the first analyzer. Building on our initial success, Medica invested in new product development to meet market demand for clinical testing and analysis for Blood Gas, Clinical Chemistry, and Hematology. These new products are manufactured with the same core values as our original EasyLyte, to meet a growing demand in the global market for low cost, accurate, state-of-the-art analyzers that can be operated and maintained with minimal training and service. Medica’s growth is a result of our strategic focus on the need for lower healthcare costs. Today, Medica has 160 employees and occupies 84,000 square feet of office, research and development, and manufacturing space, in Bedford, Massachusetts, U.S.A. Explore Medica’s milestones by viewing the timeline.